I was interested to read of teaching sign language to infants and toddlers. 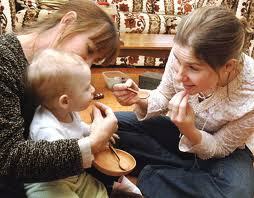 Simplified signing can help you communicate with your child from a very stage, even before they are able to speak. This will eliminate so much frustrations especially for your child as they will be able to let you know what their needs are let alone other such concepts such as thoughts and feelings. Signing most naturally starts with feeding. You can teach the sign for milk, food, sleep, etc. By this improved communication you go a long way to improve communication with your child resulting in less tantrums brought on by misunderstandings as well as develop self esteem and improve visual awareness. It is not a new concept and Makaton, a simplistic communication tool that includes sign language was developed for people who have language or speech disabilities; it is often used in intellectual or developmental disability areas. Most of you reading this wont know that I was born deaf. I had something like 20% hearing in both ears (I can't hear high pitched sounds such as consonants in the alphabet ie S, T, X etc. Thus I can't hear most birds, plastic, cellophane, a waterfall etc. I do hear some deep base sounds. Until recently I had never used a hearing aid or any sort. 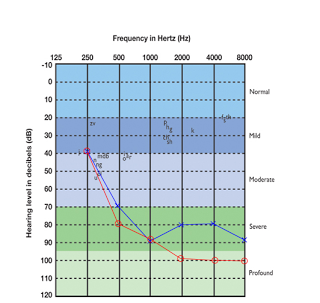 Hearing aids were never suitable for my type of hearing loss until about 4 years ago and for the same reason , I believed that a cochlear wouldn't be of much help either. I am thankful that my mother insisted that I learn to cope in a hearing world without resorting to sign language by forcing me to lipread and being extra vigilant to other pointers in communication such as observing body language etc. I attended regular schools and classes. I didn't even learn to sign until around 20 years ago when I met a deaf lady who couldn't lip read. Sometime later I suspected she had more hearing than I, yet she couldn't manage well without sign language unless there was an interpreter, I suspect a part of the reason is that she had support via special classes etc whilst growing up. So with this background I was interested to read of teaching sign language to infants and toddlers. 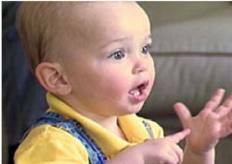 "I almost gave up on it," one mother said of baby sign language. "You really have to put in a lot of time up front. But the first day they did the sign for milk, I was bouncing off the walls excited. From there we went forward quite quickly. Always when teaching her new signs and by reading her signs I spoke the words too, so that by 9 months old, she was displaying signs for commonly used words every time she spoke the words aloud." Her child is now 2 and signs between 10 and 15 words on a regular basis. "It takes a lot of repetition," she said, "but I'm so glad I put in the effort because it has really paid off." Although they are now developing speech, their favorite words to sign, she said, include "more," "outside," "bath," "food," "finished" and "daddy." To find out more about teaching sign language to infants and toddlers and for a chart of common signs and their meanings, visit www.babysignlanguage.com/chart. Baby Signs Australia is another site where there are books, courses and videos to enable you to find out more about it. Make sure to always say the words and encourage them to both sign and speak as soon as they are able to start making sounds. You do not want to have the advantages of signing at the expense of speech development. Makaton is great for the kiddies-I have a friend with a deaf blind little boy who was taught Makaton from the very beginning,and can comunicate perfectly.